Current educational reform efforts emphasize the importance of developing students’ abilities to engage in a variety of science practices, including creating and using models, generating arguments, and building explanations. To achieve these goals, we need to change more than our instructional methods. It is also critical that we carefully reflect on how to modify our assessment tools to better elicit the types of understandings that we value. 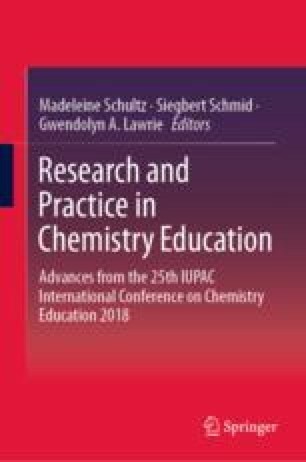 In this chapter, I describe a strategy we are using to develop formal formative assessments and summative assessment in a general chemistry course for science and engineering majors in the USA. These assessments seek to evaluate the extent to which students can integrate central ideas, crosscutting ways of reasoning, and core practices in making sense of relevant phenomena and in finding reasonable solutions to real problems. The benefits and challenges of our approach to the assessment of student understanding are highlighted in this chapter. I would like to acknowledge all the general chemistry instructors, laboratory coordinators, and graduate assistants who are and have been involved in the development and implementation of the Chemical Thinking curriculum at our institution. Support from the Association of American Universities (AAU) through their Undergraduate STEM Education Initiative is also appreciated.